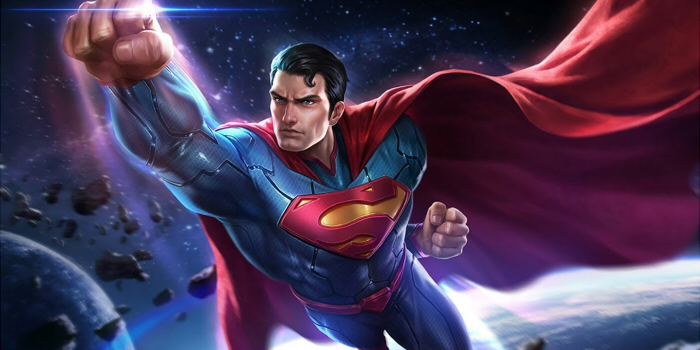 Guide for the hero Superman, a character in Arena of Valor (AoV). Included are Superman's abilities, statistics, attributes, strengths, and weaknesses. Superman has two modes: flying and walking. He gains 2% movement speed and charges energy for every 100 units he walks, and takes flight once energy is fully charged. Flight mode grants 20% movement speed when moving towards an enemy, and his normal attacks deal additional physical damage equal to 10% of his own maximum HP. Superman exits Flight mode when he is hit with a control effect that lowers his movement speed to 375 or less. Superman uses his ice breath to generate a blizzard that deals 215/430/645/860/1075/1290 (+1.27 AD)ˀ physical damage to enemies and slows their movement speed by 30% for 1 second. If in Flight mode, Superman rams into enemies, dealing (1.0 AD) (+10% of maximum HP) physical damage, and then fires his heat vision, dealing an additional 215/430/645/860/1075/1290 (+1.5 AD) physical damage. Superman unleashes his full power, which immediately frees him from control effects and significantly increases his movement speed. If in Flight mode, Superman will slam the ground and knock back enemies, dealing 335/470/605/740/875/1010 (+1.125 AD) physical damage as well as rid himself of control effects and increase his movement speed. Superman taps into his full potential, which increases his charge up speed by 100% for 8/9/10 seconds. If in Flight mode, Superman will ram into his enemies and knock them back, dealing 170 (10% of maximum HP) physical damage, and have his charge up speed increased by 100% for 10 seconds. As long as Superman keeps moving, even if he wanders in circles, he will be able to enter Flight mode. Strike your enemies with Man of Steel while in Flight mode to fly over obstacles. The damage from Kryptonian Strength while in Flight mode can be devastating, but the target area is not very big, so use it when the enemy is very close. Our recommended order for Superman’s abilities as he levels up. See all of Superman’s item builds. The build on this page is totally wrong. Could be misleading to those who don’t click “view all builds”. I am currently in the process of updating all of the hero page builds and guide pages, so a more suitable one will be coming to this page soon. I am hoping for consistency between the pages as well as much more accurate and up-to-date information across the board. Do you think it would be worth putting Arcana in that increases ability power to become more of a finisher and less of a tank? As none of Superman’s abilities scale with ability power, he would not get any benefit from ability power granting arcana. Any recent updates to Superman? Update superman. We all know he is God tier now.